Is your organization marketing without aiming for an ideal buyer? Find out how the best kept secret in marketing will disrupt your strategy. In order to grow your business, you know you need to secure a presence in front of more people—and, to be specific, more of the right people. But do you really know who the right people are? If none of your current marketing strategies seem to be working, we have some news for you: your problem has less to do with finding the right method to use or the proper distribution channel to try, and more to do with knowing your buyer. 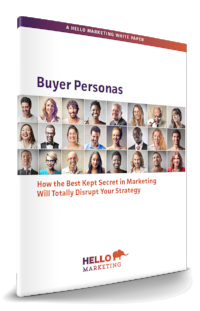 The solution to your company’s problem lies with the development of a buyer persona. Are you ready to reinvent your marketing strategy and get real, measurable results?